Earlier this year Sony Ericsson released their new ‘LiveView’ device, although due to the lack of publicity you probably won’t have noticed: a point not helped by the fact that it is incredibly hard to describe what it actually is, but seeing as we had one to review we thought we ought to find out. What it physically is, is a 128 x 128 pixel OLED screen complete with two buttons and a four ‘button’ touchscreen, what it does is offer is limited control of your mobile phone via Bluetooth and what it aims to be is an extension of your phone that sits in a user friendly manner on your wrist like a hi-tech watch, or clipped onto some other part of apparel. But the best description that I could come up with after a couple of weeks of using it is that is the physical incarnation of a simple android app; it allows you to utilise some of the basic functions of your phone from a small portable device (similar in size to the new iPod Nano) that sits on your wrist – the clip does allow you to put it elsewhere, but it is a lot more convenient to have it on your wrist like a watch. That brings me nicely to my first point about this device which is based purely on aesthetics: whilst the device itself is very small and sleek (and likewise the clip) the nylon and Velcro strap was anything but that, and although it was comfortable it would have fitted right in 20 years ago and did look as such on my wrist. But moving onto the actual ergonomics of the device and it starts off very impressively with the set up which is pretty easy — you will have to have a Sony Ericsson Android phone to start with, but using the camera on your phone to scan the QR code in the manual finding and downloading the necessary Android app onto your phone takes a matter of minutes, and once you’ve done that it’s a matter of using Bluetooth to connect the device up and you’re ready to go. This is where the first problem arises: we were using the Sony Ericsson Xperia X10 Mini Pro and found that although the LiveView sets up easily the first time, it cannot cope with the Bluetooth being cut off (by being out of range or switched off) and then connected again and we found that turning the phone off and on again was the only real solution; that is until Sony Ericsson brings out a firmware update for the device. 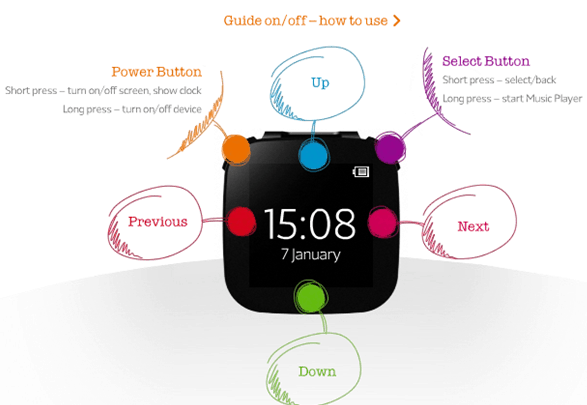 On the device there are nine main pre-installed applications which can be turned on and off using the app on your phone: Music Player, Facebook, Twitter, Texts, RSS feeds, Calls, Calendar, ‘Find your phone’ and a simple watch-like date/time display. The music player (accessed by holding down the top right button for a second or so) is arguably the best of all of these and comes into its own when you are walking/sitting/running/skydiving with your phone in your pocket or bag as it allows you to adjust the volume, pause, play and skip tracks all from your wrist. This eliminates the occasionally fiddly and time-consuming act of getting your phone out, unlocking it and adjusting your player that way, and is really the highlight of LiveView. Closely following that is the Calls function which, assuming you are wearing a headset, allows you to see who is calling you and accept/reject the call. The date/time display is nice (although pointless if you own a watch) and the texts are good to quickly see what the text was about and if it was important, but if you wish to reply it offers no real benefit. The Facebook, Twitter and RSS feeds were all fairly similar and easy enough to use, but arguably a good example of applications being put on ‘just because they can’ as I can’t imagine a likely situation where it would be of any great advantage to be instantly alerted of any tweets or Facebook updates, but maybe that is just me! Finally whilst the calendar would seem like a brilliant idea and perfectly suited to this device, it has been poorly executed as the device only lets you see events as they come along not allowing you to view any upcoming events which is a real shame as it would add so much to the device. Finally whilst the ability to press a button to get your phone to make a noise so you can find it has great novelty value, the limited range of the Bluetooth means that normally if you have genuinely lost it, you will have at some point gone out of range before you attempt to find it! Alongside those that come with the phone there are a variety of third-party apps offering things such as Gmail and weather capabilities: whilst we only have a limited experience of these (there are too many to go over them all) it is clear that there is great variation between them with some that work well, and others that really don’t, so you have to be picky. There is a theoretical battery life of four days which isn’t too bad for a device that small, and it’s also worth noting that you will need to keep your phone charged up (it will drain it a lot quicker having the Bluetooth permanently on) even if you just want to use LiveView as a watch as it doesn’t store the time natively, rather it gets that from the phone. So what do we think? Well the idea is brilliant — I was apprehensive at first as to how much I would actually use it as I nearly always have my phone in my pocket anyway, but certain applications like the music player and the calls function really give it a purpose, and in fact the ability to discretely look at your texts thanks to not having to get your phone out and appear rude was a bit of a godsend (especially in meetings). Also, the ‘techie’ in me loved the idea of having on OLED touchscreen watch, although that in itself doesn’t really merit the slightly overpriced £60. But it is far from perfect as there are a few glitches still prevalent within the applications, and the whole theory behind it is only really valid in niche situations: there aren’t that many people that need this kind of connectivity which saves you from getting your phone out of your pocket and only a slightly larger number for which it would be useful. However, a recent statement by Sony Ericsson has revealed that the device is upgradeable and hopefully some of the problems will be ironed out, also on that link is a list of some of the best 3rd party apps that we haven’t had time to go into detail about. Yes, we have definitely enjoyed looking at it, and the Sony Ericsson LiveView is definitely a pretty neat gadget, especially if you have a specific use for it, but will it really take off? 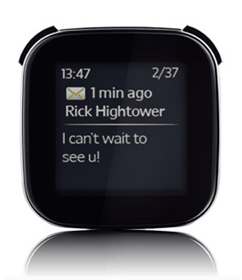 I think it’s more than likely, and expect to see more similar gadgets soon, perhaps even from the regular watch manufacturers as they start to add mobile phone connectivity to their products. For those of you that already own one you can wander over to www.sonyericsson.com/support to get hold of the update, but for everyone, there are a few additions to the Live View that are worth pointing out as they will probably make the device itself a lot more appealing (and a lot less frustrating!). Quite a few of the LiveView update features revolve around stability, the first of these being the stability of the phone application itself, which although didn’t seem to affect us in our tests, is always nice to have. The second, which aims to solve a problem we did notice, is the stability of the connection which according to Sony Ericsson should be a lot better as “most identified reasons for random disconnects should be fixed now”. One of the major problems that we did experience was the issues that the device had when attempting to connect with the mobile phone after having gone out of range, but that too has been improved with the update and whilst no-one will go as far as to say that it’s perfect it certainly removes one of the biggest annoyances with the LiveView product. The final two major additions in the update are in fact ones that we didn’t even think of (quite possibly because they weren’t especially important at the time) but ones that nonetheless increase the appeal of the device – if nothing else purely because more people will be able to use it as the compatibility with phones from other manufacturers has been improved, principally with stability (again!) and battery life. Users of other mobile phones will still experience some problems with stability and re-connection issues, but according to Sony Ericsson’s labs they are limited to specific phones running Android 2.2 (Froyo) and can be easily fixed with a reboot. As well as that the limit to the number of plug-ins that you can have at one time has been raised to 30, a move probably prompted by the rapid increase in the number that are available on the Android Market which has seen some fairly innovative additions: my favourites are definitely the ContactCall plug-in which allows you to (as you can probably guess) call people on your contact list (something that arguably the device should come with as it’s that useful), and Remote Camera which does exactly what it says on the tin. This is far from a fix-all solution but it does go quite a long way there; however whilst this update does make the Sony Ericsson LiveView, much more appealing is going to be the App Market that could really make the LiveView a hit, so we will have to wait and see just how much that will expand and what innovative apps appear and how popular they become!